A question on graphs from my cousin. She's good with statistics, but not a programmer. I've fielded similar questions many times, so figured it'd be worth putting the answer in the public domain. 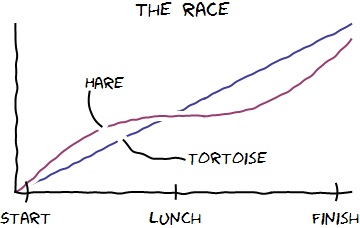 Any graph that includes the caption "lunch" is a good graph. Also "nap." Quick question-- I'm writing up a paper right now and need to stick some simple graphs in. Do you have any suggestions ways to make graphs that are prettier than Excel to Word (low bar...ha ha! Accidental pun!)? On graphs: How many graphs are we talking? If it's just a handful, or if they're all different kinds, I'd recommend Photoshop or Illustrator. Import the graph from excel, and then "trace over" it to give it the styling you'd like. A lot of great data-centric presentations use this trick. Another option is tableau. It's a pricey, but gives you good tools for designing nice-looking graphs, as well as tools for automating them (i.e. generating 20 graphs with the same basic template.) You might be able to use a 30-day trial; and maybe their student licenses are cheaper than the corporate ones. If you don't want to shell out for tableau and you're doing *lots* of graphs in the same style, then it might be worth climbing the learning curve for matplotlib, ggplot2, or the google charts API. I doubt this is worth your time because, there'd be such a long learning curve: each of these is a graphing library on top of a programming language, and you'd need facility with both to make them work. Getting graphs right is fiddly work. All those axis and labels and spaces to play with, and that's before you even begin to think about borders and color. I've toyed with the idea of a declarative language for graphs: a syntax for describing the story you want told, without including all the execution details. For example, "A is more Y than B" should give you a nice bar chart with a tall column labeled "A," and a shorter column labeled "B." The y-axis should be labeled "Y." this is a shameless promotion of my company's own product line, but we have a cloud-based free data visualization offerring. it's pretty easy to use so the learning curve shouldn't be too steep. i'd love to get your feedback on this if you try it out. ps - do you still keep in touch with any tj folks? @Vihao Thanks for the (shameless :) ) recommendation! On TJ people: yes, but not as much as I should. Should we take the conversation to facebook?